SAN FRANCISCO (AP) — Thousands fled their homes as major wildfires encroached on a charred area of Northern California still recovering from severe blazes in recent years, sparking concern the state may be in for another destructive series of wildfires this summer. In California, officials said unusually hot weather, high winds and highly flammable vegetation turned brittle by drought helped fuel the fires that began over the weekend, the same conditions that led to the state’s deadliest and most destructive fire year in 2017. “What’s happened with the more warming climate is we get low humidity and higher winds and then when we get a fire that’s worse than it’s been in those 50 years,” Steele said. A forestry scientist says it’s difficult to forecast how severe California’s wildfires will be this year, but said the drought-dried vegetation throughout the state is a bad omen. “You have a lot of grass and its dry and that’s cause for concern,” said Keith Gilless, the dean of the University of California, Berkeley’s department of environmental science. 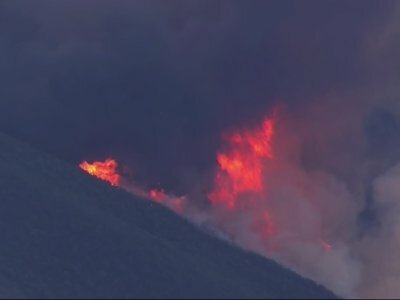 While the weekend’s blazes were the first major ones of the season to hit California, others have raged throughout the west for weeks. Earlier this month, a Colorado wildfire forced residents of more than 2,000 homes to evacuate. The last evacuees returned home last week. Associated Press writers Lorin Eleni Gill and Janie Har contributed to this story from San Francisco.